An equinox occurs when the center of the sun appears directly over the equator and shines equally on both the northern and southern parts of the earth. I am a fan of Linda Bleck's warm and colorful illustration. 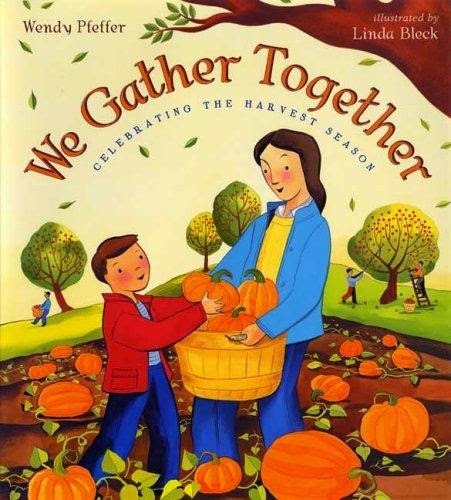 In We Gather Together: Celebrating the Harvest Season, Bleck depicts a cozy world reminiscent of that in Little Golden Books and books by Lois Lenski. The book opens with adorable fox pups and a cute black bear. The illustrations of farm workers have a childlike simplicity. Very young children will be drawn to the pictures. But the amount of information makes this introduction to the fall equinox a picture book for first grade and above. We Gather Together is a nice blend of science and culture, with an "Equinox" corn muffin recipe, simple cultural and science activities, and a list of harvest festivals from around the world included.